Dryer will work fine at times, then start turning off too soon on auto-dry. If I switch to timed dry, the timer will time out too fast ie. set timer to 60 min., it times out in about 20 min. These conditions don't change with the vent hose removed. 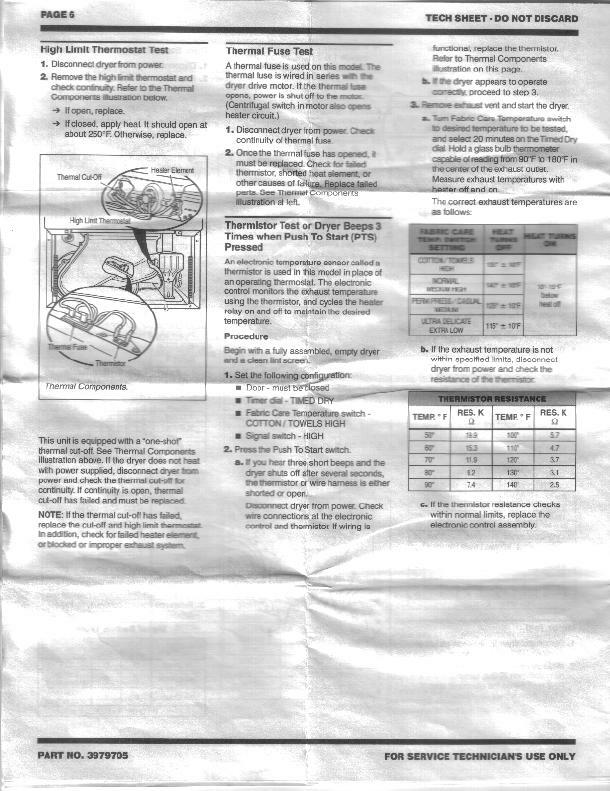 I used the diagnostic tests included on tech sheet inside the dryer and sometimes it will not enter diag. mode. When it does, all tests pass. I tested the thermistor and it measured ok for the temp in the room (dryer had been off and disassembled for an extended time) The moisture sensor tested good in diag mode as well as continuity. Should I replace the electronic control board or would it be worth my time to resolder all connections on bd in case of cold-solder joints, or should I be looking elsewhere for solution? If the dryer is counting down too fast even in timed dry, this is a bad timer, slam dunk. If I were on the service calls, I'd also check to make sure nothing weird was going on with the power frequency, this is only a remote possibility. Word of caution on this, O Leader...this is an "Even Heat" model, where the timer receives its power via the microprocessor. I think I've seen this before, and it turned out to be the board that was the issue. I hadn't considered that, Mac, thanks. Storm, can you post or fax (775-416-4449) the wiring diagram so we can feast our squinties upon the circuitry? 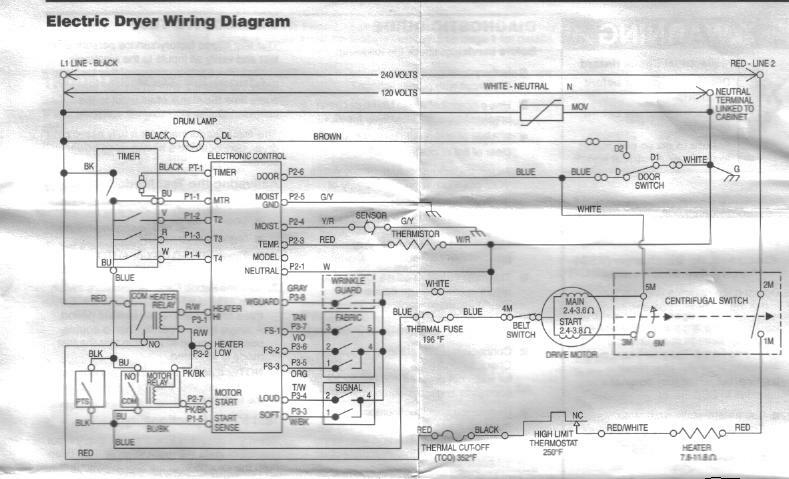 Here is the wiring diagram from the Tech Sheet. The Mad One hath spoken well for your timer does indeed draw its power from the infernal Even Heat control board. If I were on the service call, I'd use my frequency-counter-equipped multimeter to check the frequency of the voltage supply to the timer motor on timed dry, expecting to find a frequency much higher than 60Hz, usually some harmonic like 120 or 180 Hz. Absent this equipment, you're left to making educated guesses based on elimination and information gleaned herein; not as risky as it might sound. For example, if you were to replace the Even Heat control board using the parts form at the bottom of this page and that didn't fix the problem, you could return it for a refund, even though the board was installed. Caution: You will not get this kind of safety net from local parts suppliers. There is 60 hz applied across the timer motor when it's commanding the timer to count down, no input voltage when idle. That is what it reads during the timer test as well as under normal operation. I checked the impedence of the timer motor as well as the the timer switching while I was at it and it all checks out. I can't say for sure if the dryer is actually failing at this time since it hasn't been used all day while I was at work, but it was failing last night while drying towels. I think it would behoove me to get some clothes wet and see if I can get it definitely failing, so I've got a load washing right now. May as well take advantage of a working unit! I think it would behoove me to get some clothes wet and see if I can get it definitely failing, so I've got a load washing right now. May as well take advantage of a working unit! While it's drying a load of wet clothes on timed dry, check the voltage and frequency at the timer motor. This is starting to come back to me now....there is a "timer test" on the tech sheet, something about on for 7 seconds and off for 113...I don't remember exactly, but it was something like that. Check the tech sheet. Tech sheet doesn't refer to specific time intervals, just once you place unit in Diagnostic Test Mode, the timer should run continuously from wherever you set it until it times out. If it doesn't, then remove all wires from timer, check impedence across timer motor, then using the "Timer Encoding Table" to verify "switching conductivity. should read 3k +/- 2. 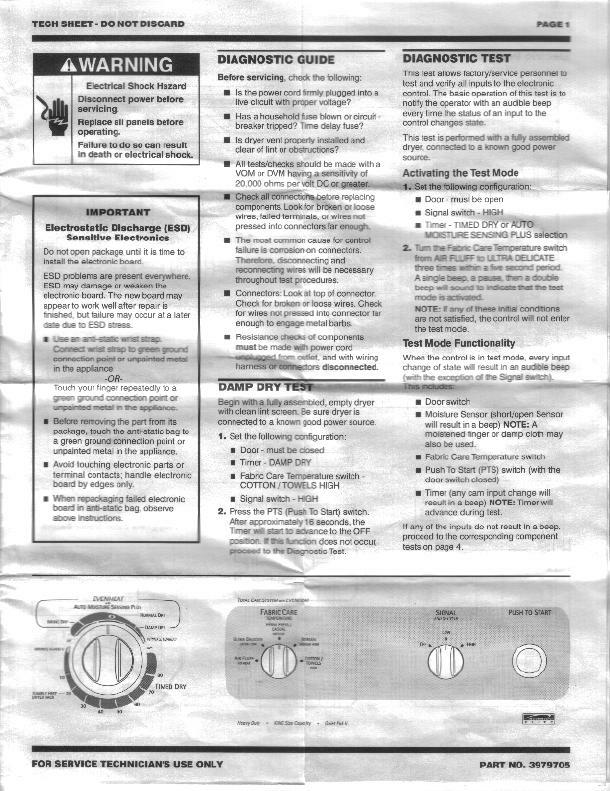 Mine rwae 2.4 k.
Could you attach that part of the tech sheet, too, so we can see what you're reading? Well, the 60 minute timed cycle took only about 40 minutes and the clothes are not dry yet. I' m going to reset the timer so that I can finish drying this load, unless you have something else in mind to check. I've got another wet load on standby to continue troubleshooting with, if necessary. I'll send a few pages, but would be happy to share the entire document when I can iron out the creases and fax it. Must I adhere to the 150k barrier for posting? Must I adhere to the 150k barrier for posting? For now, yes. I don't have a way of increasing the limits for certain users so any change I make on upload limits affects the entire board and all users. If it's easier, fax it to me and I'll post it as a pdf file. 775-416-4449. Hay, Storm, got your fax, it's not much better. 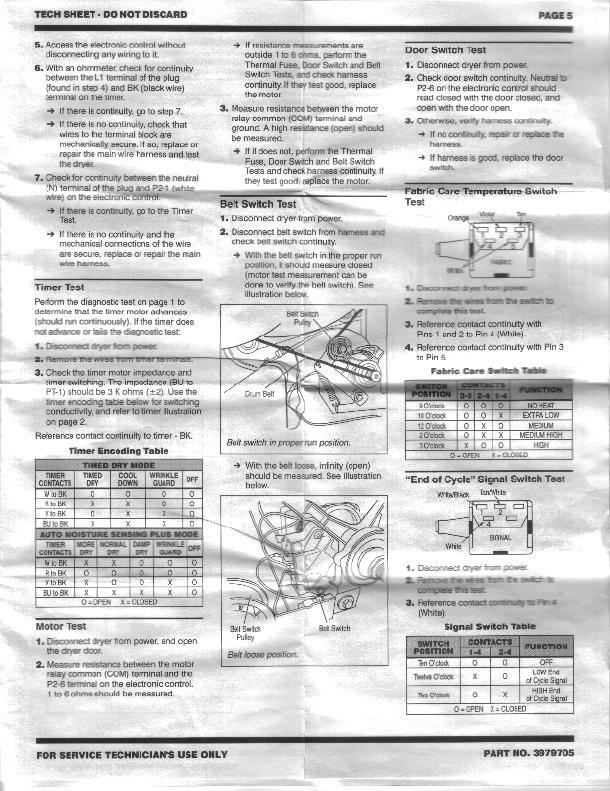 Never fear, though: I borrowed a copy of the tech sheet for the exact same dryer that I worked on today-- needs the Even Heat Board, won't energize the motor relay so the motor stops when the start button is pressed. I'll be out of town all day tomorrow but I'll be back tomorrow evening-- I'll review the tech sheet then and post any fermented revelations that come to me. Okay, thanks. Sure would like to get a copy of the schematic for that board, not much on it to run up the cost to $100. Hey Storm, when you run the diagnostic test, does the timer stop when it gets to the off position or does it keep running? If the timer terminates properly, replace the Even Heat board. If the timer keeps running, replace the timer. The timer stops as it should. Thanks for the help. I replaced the even-heat board and the problem remains the same. I checked the timer test again and the timer stops as it should. is it time to shotgun this one? My first hunch of a bad timer with the report of it counting down too fast must have been correct. When will I learn to stop second-guessing myself? Return the even heat board for a refund and order the timer. Well, the timer did not correct the problem either. Looking at the schematic for your dryer, the only way I can see that the problem isn't either the timer or the even heat board is if the supply voltage is off-spec. But you've checked that. Since we've covered all the bases and replaced the only two components that could cause these problems, we're down to an intermittent harness connection. This is difficult to find. Sometimes you can find it by inspection. But most of the time, you need to set your ohm meter, to ohm out each run of wire, end-to-end, while wiggling the wires until you get a jumpy reading. It's time-consuming, tedious work, but that's where we're at with this one-- there are no other components in this dryer that could cause the symptoms you've described.